When you work with Rinaldi Homes, you become family. From start to finish, it is our goal to bring expertise and value to every interaction we have, and to make each and every one of our homeowners feel 100% satisfied with their Rinaldi Homes experience. We’re very proud of our dedicated team of professionals who make it possible for our clients to become the happy homeowners they are today. Building our family home with Rinaldi Homes was a wonderful experience that started from the very customization of our plans. The staff at Rinaldi Homes was very flexible with all of our wishes accommodating our long closing and the numerous changes to our plans. In that time they guided us in making practical decisions on the layout and offered many ideas that were thoughtful along the way. During the selection process, they provided many opportunities and choices that made our dream home come true without making us feel overwhelmed or pressured into making decisions we weren’t ready for. Their great quality and choice in finishes allowed for many creative and custom decor options to make our home unique to us and also fit our busy family lifestyle. They helped us create a stunning kitchen that serves our immediate family of 4 on a daily basis but also a home that opens the door to a large extended family and friends on many occasions, all who feel incredibly welcome when they set foot in our home. Thus, their attention to detail and expertise in all areas of building are what made us thoroughly enjoy the process from the initial customer service to their care for us now even after we moved in, their creativity, craftsmanship and affordability. All this makes us look forward to many memories and years to come in our new Rinaldi home. I purchased a home from Rinaldi homes last fall (2014). The building of the home was completed in the spring of 2015, and all aspects of the transaction were much more smooth than I would have anticipated. I purchased the home for occupation by my 82 year old mother, who was at the time living in a townhouse in Welland. She was delighted that she was able to pick out all the finishings – from her cupboards to her flooring, and all of the many accessories in between. Rinaldi’s staff and contractors assisted in co-ordinating everything so that it became virtually effortless. Dates were met, scheduled appointments were kept, follow-ups were done, and everything with a smile and a great attitude. When we were picking out my mother’s cupboards, etc., the staff couldn’t have been nicer and more patient with her. She had never had the opportunity to enjoy such a task, so she was like a kid in a candy shop – so many choices for her. The staff took all the time she needed and had a lot of fun with her. The whole process was extremely positive for her, and that was, of course, very important to us. As the unit was being built, we were kept informed and any questions or concerns were welcomed. 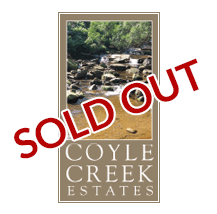 We requested a slight extension of the closing date which was granted quickly and with no ceremony. The final walk-through was very thorough, and the (very) few adjustments that had to be made were done in a timely manner – again, with a smile and a great attitude. Closing day came and went without a single hitch. No matter how enjoyable buying a new home, having it built and picking out all of the amenities may seem, it is still a time-consuming and difficult task. I can honestly say Rinaldi made it pleasant. It’s comforting to know that you’ll actually get a response and action if there are any concerns or issues. I would absolutely recommend Rinaldi, and wouldn’t hesitate to purchase or deal with them again. It is with great enthusiasm that we write this letter of recommendation in support of Rinaldi Homes Inc. In order to be closer to our daughter whom lives in Toronto, we moved across the country (from Calgary, Alberta) and choose a new home. 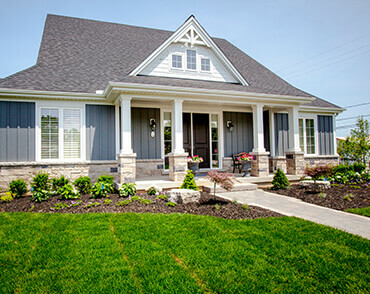 Through our relative, we were told about the highly respected Rinaldi Homes as a builder of high quality homes in the Niagara Region.We were fortunate to find Mr. Rinaldi had one last lot available in his Courtland Valley Estates Development in St. Davids. In our first meeting we were presented with drawings of a unique and beautiful house design to suit the corner lot. With their design we were given the opportunity to upgrade and customize any interior portion of this home. Naturally we reacted immediately to this opportunity and later signed the contract. We can honestly say that from our first meeting with Rinaldi Homes we were thoroughly impressed with the quality of staff professionalism, workmanship and integrity. Rinaldi Homes exceeded the level of customer service and satisfaction. They met each and every commitment, budget and timeline. The result is that we have a beautiful and outstanding new home all made positive by Rinaldi Homes and their staff. With many thanks. It has been a little over a year since my wife and I moved into our new Rinaldi home. With that “still new”smell in the air, I thought it a good time to reflect on our buying experience with Jerry Rinaldi and his team. From my first meeting with Jerry and a member of his sales staff, I could sense this was going to be a different experience than what I had become accustomed to with previous builders. This is my sixth new home, so I’m not short on horror stories about dealings in real estate. Hoping that I wasn’t being naive, it seemed to me that Rinaldi Homes actually cared about what WE wanted, and not what was easier or more profitable for them. Here was a gentleman where a handshake meant something. Anyone that knows me describes me as being quite picky. If you ask Jerry, he’ll tell you that this is an understatement. We knew exactly what we wanted in a new home, and with some fine tuning under Jerry’s guidance, every detail was addressed and we sealed a deal. We were involved in every aspect of the selection process, literally from the ground up. While a lot of work, Rinaldi’s team made the task enjoyable. Watching our new home being constructed was fun and exciting. Under the watchful eye of our site supervisor Franco, the process moved forward seamlessly. He was never too busy to answer our questions or concerns. We soon learned that honesty, integrity and professionalism was a culture at Rinaldi Homes. The most telling testimonial I can provide is that my older brother and his wife are now the proud owners of a new Rinaldi home. He had been in the construction industry in Alberta for over half a century before retiring, so he knows a thing or two about quality. After one short visit to our home, and considerable time inspecting all its aspects, they decided to pack up and move east. The rest as they say, is history. It has been about three months since we moved into our new home and we are thrilled with the design, the functionality and our whole experience with the Rinaldi Team. We made the decision to relocate from Brampton after searching many areas and exploring many builders in different areas in and around the GTA for 2 years. Finally, we found Rinaldi Homes and the difference was unmistakable. The craftsmanship, the attention to detail and the quality are evident in every area of our home and in the whole process of dealing with the Rinaldi Team. Our experience was a delight from the first visit. We were kept informed and up to date about the progress of our home and it was great to receive periodic pictures from Vingy so that we could watch our home take shape from afar. All the staff we met is professional and truly care about the quality of the total experience in building a home. We would like to thank everyone who helped us start our new life in Welland and for making this transition a great experience. Our sincere thanks to all the Rinaldi Team and specifically Marco, Vingy, Amanda, Victor, Brett, Michael, Richard and Joan. We will not hesitate to recommend Rinaldi Homes. Congratulations on your new partnership with Mike Holmes! We recently purchased a home from Rinaldi Homes and we were so impressed with our experience with this homebuilder that we feel compelled to forward our comments to you. We were planning on retiring to the Niagara region from Kitchener and our knowledge of the local builders was very limited. Our journey with Rinaldi Homes began at one of their communities in Welland and from the moment we entered their model until we finally entered our new Rinaldi home we were amazed at the professionalism of every member of the Rinaldi team that we dealt with. Our initial encounter was with Victor Krmpotic who went out of his way to assist us in choosing an initial floor plan. This process continued with Anne Beedles. Anne guided us through the purchasing process and helped redesign the loft area. We actually feel that we now have a custom home because of the changes we were allowed to make to the original layout. Anne was always available for any questions we had. Franco Mastromatteo the site supervisor is simply incredible. His staff not only works hard for him but we saw a respect that is truly amazing. Franco led us through the building aspects of our new home and even managed to have our closing date moved up to accommodate some rather awkward requests on our part. This man never, ever forgets a request from a customer and to say he is generous is putting it mildly. Franco clearly has the respect of all the trades who worked on our home. Our home is a true testament of the Rinaldi quality and the design and choices we made for both interior and exterior aspects of our home came together only with the guidance and tutoring of Amanda Aiello. She literally helped us make choices that today we are the envy of our friends and family. Amanda is a very talented and enthusiastic designer. Rinaldi Homes are simply a testament to the highest quality and standards we have ever known. I just wanted to take the time this morning to express my sincere appreciation for the exquisite job your crew did on our new home, Lot 30, 20 Goring Way. We were through the house yesterday for our PDI, and to say that Reg and I were impressed would be an understatement. We love the house, the finishes are beautifully done and the craftsmanship is impeccable. I wanted to let you know that from start to finish this has been the best experience we have ever had with a builder. The site was meticulously clean at all times and the times we did visit the site during construction all ofthe trades were so helpful and willing to take a moment to speak with us and answer any questions we had. Amanda is an absolute gem, she made the selection process easy and efficient. She was always available for us anytime we needed anything, and went above and beyond to make sure that we were taken care of. She is truly an asset to your company and represents Rinaldi to the highest standard. I cannot say enough about her, she was such a joy and took great pride in her work and it reflects in the magnificent house that stands today. Bret was awesome, anytime we had an issue or a concern he made sure to take the time to discuss it with us, and made all of the necessary adjustments and took the initiative to correct issues before they became a problem. Franco was wonderful to work with, he was very detailed at the PDI he was very personable and made our experience at the PDI straightforward, and stress-free. I know that Reg had met him on site a few times prior to the PDI and did mention how he was always very accommodating, and extremely knowledgeable. Richard was also very professional at the PDI and made sure to take the time to explain everything to us, he was well-organized and very thorough. You have an amazing team of people working for you, I know that I have probably forgotten a few names, but from start to finish and from the foundation to the roof shingles your team has put their heart into this house and we are exceptionally grateful for the effort put into the finished product. It was a big decision for us to sell our home in Toronto and move to a small community in Ontario. We have been in our new home for about six months now and have loved the whole experience. Rinaldi’s genuine interest in delivering the home of our dreams shows in all the details. From start to finish, Gavin gave us the personal attention we needed, answering all of our questions, giving us advice, and keeping us informed. We always felt welcome on this site to see the progress and all of our concerns were addressed promptly. We would like to extend our sincere thanks to Gavin, Wendy, Frank, Marco, and the whole Rinaldi team for making our move such a pleasurable experience. It’s been just about a year since we moved into our house. Till this day my wife and I are still in disbelief that it is actually ours. From the day they broke ground watching every step of the way until the finishing touches were done, the anticipation was getting greater for that day to walk through that front door. This of course wouldn’t have happened without the great team at Rinaldi Home’s. The first day we met Gavin Mollica, Project Manager at Tetherwood Estate, truly professional, guiding us through each step and if we had any concerns or changes we wanted to make, it was not to be a factor. They were building our home. We were introduced to Wendi, Interior Design Co-Ordinator through her magic, she helped us make the selections and colours, and she made it so easy. She is just amazing. To Frank and Jerry, and to your wonderful staff to your team of trade’s people and to all the suppliers, without exception making our home with every detail special, and without hesitation any concerns we may have your are just a phone call away. Thank You, for building our home for us to enjoy for many years to come. In conclusion we would like to say Thank You, to each and everyone, and to anyone who is considering building a new house come and see what Rinaldi Homes can do for you. We are proud to say that our home is a Rinaldi Home. It is with much pleasure that we write this letter. We can not be more pleased with our new house. The Rinaldi Team was professional, helpful and always very prompt in answering questions and concerns. Everyone we have dealt with has been exceptional. Now we have a home that we LOVE! The house is beautiful and we are very happy. Thank you very much for helping us achieve our dream. To your entire staff and sub-contractors, we thank you. Just a quick note to thank all of you involved in making our “New Home Experience just that, a great experience. As life long residents of Welland but never owning a new home, Cindy and I decided it was our time. We looked at every new subdivision in Welland but soon chose Rinaldi Homes as our builder of choice. From our first visit to their model home on Empress Avenue, to the day we received the keys to our new house, the adventure was flawless. Dealing with Gavin Mollica was truly a pleasure. Always attentive to every detail, teamed with his vast knowledge of the building trade our home became more than we even anticipated. Also during the process when crucial decisions or changes had to be made, everyone on the Rinaldi Team focused on the end result, our satisfaction. They all made you feel like family, so you never had to worry. Just a small note to say thank you very much for all your help & patience in helping Greg and I get our dream home. We have been in the house for almost a month and it still has the WOW factor! We are so pleased with the end result and again – thank you for all your help. The entire Rinaldi team has been excellent!! We have been in our new house for one month now, and are still pinching ourselves to check if it is real!! We are so thrilled with the house, and wanted you to know how much we are enjoying living here so far. The house is beautiful and everything is working so well, we are very impressed with the design, the workmanship, and attention to detail, thank you so much. Thank you all for the part you played in delivering our dream home. You have given my husband and I the house of our dreams, thank you just doesn’t seem to say enough but I will say it anyway, thank-you, thank-you, thank-you! You truly went beyond the call of duty to get us into our home and to ensure that everything was perfect. We truly cannot thank you enough. Ed and I will recommend Rinaldi to everyone we meet. You Continually exceeded our expectations with your work ethic, professionalism, high quality products, knowledge and so much more. Thank you for exceeding our expectations in building our new home. We love it. Now that we have been here for 7 months we would like to pass on more detailed comments about what we so enjoy about our Rinaldi home. We picked Rinaldi Homes to build our house based on our friends’ recommendations that your homebuilding standards are higher than others to begin with. All of the people who worked on site also agreed with this assessment of the high quality of Rinaldi’s finished products. the beautiful windows maximize the light, views and its architectural style. extra efforts to conserve our only large tree were worthwhile. the stone and brickwork, including arches, is meticulous. the faux fireplace looks antique. the pantry and closets are spacious. Others agree that our home is attractive as we have already been asked to include it in a local house tour program for charitable purposes… which we may consider in future once the property has settled and the landscaping is complete. The kindness, expertise and excellent customer service skills of all involved in creating and servicing our house have been unsurpassed, even after moving in, and are much appreciated. Based on our positive experience, we happily recommend working with Rinaldi Homes on new construction and renovations. Since this is the third new home we have built, we should know! Best of all, you made it possible for us to move in early… that was unheard of in our previous homes. Thanks again for making it such a pleasure to build with you. Please let us know if there is anything we can assist you with in future. Hi Gavin, thanks for checking in today it was a pleasant surprise. David and I are really happy with the house. This whole experience has been exciting and thanks to you and the rest of the Rinaldi team it has been a real pleasure. Big thanks to you for holding are hands through the whole thing and for knowing just what to say to bring David down lol. Wendy was a God sent with helping us choosing are colors and for getting to know just what we really wanted and not pushing us to the extreme. I’ve even stolen some of her ideals from the model home to incorporate here. Thanks to Ruth as well for just being so friendly and patient any time I’ve called. I’m amazed at just how busy it is here in Tetherwood Estates and just how organized everything seems to be and Frank’s constant presence is both reassuring and amazing. To see a boss who really picks up the slack and gets dirty with the rest of the workers is well just amazing. I also wanted to take a minute to thank you for all the contacts you have shared with us. In closing just a really big thank you to you and the rest of the Rinaldi team. We would like to thank you and your representative, Ruth Reynolds, for all the assistance given us in our recent home renovation. As the renovation is now complete, we’d like to share our experience with your company with you. First and foremost, we’d like to advise you that Ruth Reynolds is an exceptional asset to your company. Her advice and assistance throughout our renovation was truly outstanding. Her availability and willingness to drop by our home on a daily basis was far above the service we had expected from a renovation consultant. She was always pleasant and willing to approach the tradespeople with any questions or concerns we had. She accompanied us on the purchase of various items and was very knowledgeable about the products we were searching for. Her work schedule was met almost exactly and there was never a time we wondered what was going to happen next or what tradesperson was required. She always stayed in constant contact with us and made us aware of what the next stage in the renovation process would be. Ruth is truly ‘customer service’ oriented and you are very fortunate to have such a wonderful employee. All the work was completed to our satisfaction and your trades persons did their best to fulfill our vision of what the completed project would look like. All the trades were punctual and friendly. They completed their assigned tasks on time and were available for consultation on a very short notice. As the project is now complete, we’d like to thank you for your professional assistance. We are very satisfied with the renovation and would not hesitate to recommend your company to others. We just had the final piece of sod laid in the yard of our home. I wanted to take a moment to write and say thank you for giving my wife and I the home of our dreams. Some days I still stand out on the road in front and just stare at the house in amazement that it is ours. Thank you to Wendi for all of your help picking paint colours, door styles, fireplace stone, brick and list goes on and on. The house would not look half as good as it does without your assistance, guidance and most of all patience. Thank you Bret for putting up with my short term memory and excitement when I would forget things you had told me or asked me about. You were always allowing us the opportunity for input and never once said no to us on anything that we wanted. Your continued assistance after the sale in tying up loose ends has been much appreciated. Thank you to Frank for putting up with the 30 or so add ons we had. For being professional throughout the entire process even when we didn’t see eye to eye, and most of all for giving my wife and I our dream home to raise our kids in. Every single sub contractor was polite and professional when we visited the site and they were always willing to answer a question or two we had about the build. When people ask us about the house, we are proud to say Rinaldi homes built it for us. Believe me when I say you have built the home of our dreams and we are extremely happy with the high level of quality in the finishings. Our sincerest thanks to all of you. I would just like to take the opportunity to express my satisfaction in working with Rinaldi Homes in the building of our family’s home. Building a new home is a considerable investment, as well as a great deal of personal choices to make in the process. The Rinaldi’s, and their staff of professionals, where considerably helpful in the entire procedure. We found the quality of workmanship to be first-rate and they seem to take pride in the work they do. After looking around at other builder’s products, we seemed to keep coming back to a Rinaldi home. In regards to any issues that arose after moving into the house, they were handled without delay, and they never left us waiting for a reply from their office. This type of integrity is difficult to find today, and I would like to commend you on your genuine effort to satisfy your customers. After speaking to our new neighbours, all that we spoke with seemed to agree that Rinaldi Homes offered more than others in quality and integrity. I would highly recommend you to any one about to take the new home plunge. I would like to take this opportunity to commend you for the superb craftsmanship on our house at 19 Fredonia Crescent. We have been in our home for 30 days and there are still no problems with the house. In this day and age when you hear so many stories of poor workmanship, it is very satisfying that as a Rinaldi homeowner, we are the exception to the rule. Before we even agreed to purchase, you took the time to answer all our questions. You also went to great lengths to ensure our satisfaction with the plans before construction had started, but perhaps we were most impressed with the ongoing adjustments made during construction. On several occasions, you approached us saying, “I don’t like how this will look so if it’s OK with you, I would like to change it to this…” The consideration shown in the design and subsequent construction were as if you were building this home for your own family. I would like to thank the rest of the Rinaldi team for a job well done. Joan was wonderful in helping my wife. Her imagination and understanding of our needs allowed Brenda the confidence to make the choices to obtain the look of the house she wanted. Frank’s attention to detail and quality assurance were reinforced throughout the construction. In speaking with contractors it was easy to understand why he is well respected. His standards are never compromised. Frank has always answered my questions and continues to ask if anything needs attention in our home. Margaret, Brett, Jake, Frank Jr. and Kyle are always pleasant to my family and each has taken the time to answer any questions we may have had. I have seen first hand the hard work Brett and the guys have put into our house, especially in the extreme heat this summer, it is greatly appreciated. Again I thank you and your staff for building a wonderful house for my family. We are looking forward to spending many years in it and we hope you are as proud of building our home as we are for living in it. There are no words to express our gratitude to all the staff at Rinaldi Homes in building our new home. As you know my family and I moved to St. Catharines from Vancouver in January of 2005. At the time, we had looked into resale homes and building a home. The first time we met Margaret at the Franklin model home we were sold. As soon as I walked into the model home, I knew this was the home for us. A big thank you goes to Margaret for her professionalism, kindness and making us feel at ease. She has been available every step of the way. Also a big thank you to you Joan for all your great advice and for making me feel comfortable since I wasn’t from St. Catharines and not familiar with the area. Once again, a big thank you goes to all the great staff at Rinaldi Homes for a job well done! I just want to take a moment to thank you both personally for our new home. We still have 30 days till close, but we are so excited and honored to take possession of a Rinaldi Home. We both go by often since work has begun and are delighted with the progress. Your tradesman are truly talented and deserve praise. We will be proud owners. Again Thanks. Rinaldi Homes allowed us to create a custom home from a standard floor plan. There is no other home like ours, anywhere. We really like that distinction. We had been looking for a new built house or condo for many years prior to finding Rinaldi Homes. 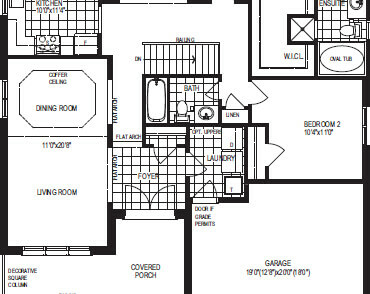 Other builders had pre-set plans with one or two choices in colours, flooring, tile, and kitchen and bath layouts. I found I didn’t like their choices and they emphatically would not change them. Rinaldi Homes is different. It was no problem to change the floor plan to accommodate our needs. We moved walls, brought the laundry to the second floor, expanded a bedroom and the garage, moved the powder room, added closets, moved plumbing, added a fireplace, added a custom 4’x4′ shower, raised the kitchen island and master bath cabinet heights, and more. Never did we hear the word “no”, everything was do-able. And, the best part for us was that each item was detailed and reasonably priced. Rinaldi Homes advised us of the credit we had with each of their vendors and we got to choose the brick colour and style; carpet, tile and hardwood flooring; lighting; placement of all electrical, satellite/cable and internet cabling; as many paint colours as we wanted; kitchen and bath cabinets and hardware; fireplace design; and more. This may seem like a lot of work, but it made our home, our home, and not the builders. If we chose to upgrade anything, it was at our option and we knew the cost of each upgrade as we were making the choice, no surprises. With all the changes and decisions we made prior to and during construction we were never left with the feeling that we were being “nickeled and dimed to death”. During construction, we toured the house as it was being built at different stages to make sure that the changes to the plans and our upgrades were not going to be any problems later because we had been told by others who had built homes with other builders that you really had to watch and follow-up. We did not encounter any of the problems we had been warned about. If we had an issue or question about the house during the construction process it was immediately answered, and if necessary resolved within a matter of days. Many times Rinaldi Homes told us of issues and what they were doing before we became aware of them. We were surprised and very pleased with this level of service. Rinaldi Homes delivered the house on-time and on-budget, no delays or surprise charges. Rinaldi Homes has a superior team of staff and vendors. They made the whole process stress and pain free for us. We have been in our home 6 months now, and if we have a question or concern, Rinaldi Homes gives it the same attention and immediate response that we received during the construction period. We can’t say enough positive things about the team or the workmanship. To anyone looking to purchase a new home, we would whole-heartedly recommend Rinaldi Homes.